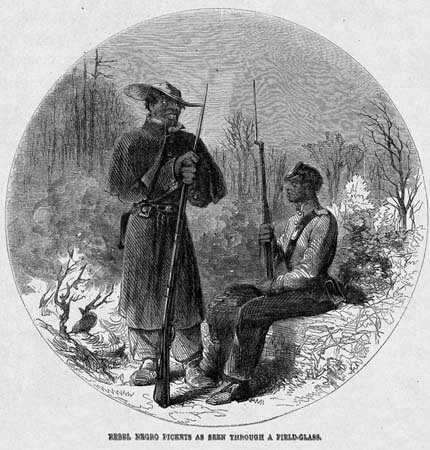 A drawing published in Harper's Weekly, depicting African American soldiers in the Confederate States Army. Image courtesy of the Library of Congress. With the Confederacy facing probable defeat in the Civil War, its Congress passes General Orders, No. 14, allowing for the desperate measure of enlisting slaves in the Confederate military. For years prior to this, a number of Confederate leaders had suggested this as a way of mitigating their size disadvantage against the Union (which itself started officially enlisting black soldiers after the Emancipation Proclamation took effect on January 1, 1863). Nonetheless, the Confederacy long resisted this measure because of widespread racism and because it would legitimize the abilities and humanity of slaves, who were subjugated under the very institution Southerners fought to protect. Coming so late in the war, General Orders, No. 14 has little effect on the outcome. It offers slaves "the same rations, clothing, and compensation as are allowed to other troops in the same branch of the service," but it does not extend freedom to the slaves who serve, giving them little personal motivation to support the Southern cause. Ultimately, very few blacks serve in the Confederate armed forces, as compared to hundreds of thousands who serve for the Union.